CASA volunteers and CASA staff can find helpful info here. Besides using CPRS as a tool to research cases (by viewing current case plan information), CASAs can record their recommendations in a standardized CASA Court Report and then submit those approved reports to the court, attorneys, and DFCS in real-time. And CASA program staff can utilize CPRS to manage their programs and generate required reports from CPRS. What cases can a volunteer access? Volunteers can view only those cases that have been assigned to them. They cannot search for cases like a CASA staff person. 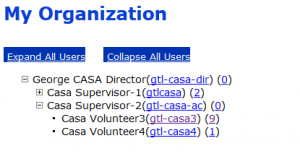 How do I see which volunteers are assigned to me (a CASA staff person)? Visit the My_CPRS page, & select the My Team link. Is there a way to see everyone in our program? Visit the My_CPRS page, & select the My Organization link. How do I assign children to my different volunteers? Volunteer Coordinators should open cases. At the bottom of the Roadmap screen, those users will see a Manage Cases button that other users do not see. When you select the Manage Cases button, the system displays a new screen for making assignments. Simply check the children that you wish to assign. Then, from the drop down, select the CASA volunteer who is responsible for the child(ren) selected. The Manage Cases screen also displays current assignments. Each child can have more than one CASA Volunteer. And each volunteer must be associated with one staff (Volunteer Coordinator) in your office. When the volunteers sign-in for the day, they will see only their assigned cases in their My Cases list. How come I don’t see one of our volunteers in the dropdown during assignments? Once Organization Sharing is turned on, any advocacy coordinator (staff) in the program will see all of the program volunteers in the Manage Cases assignment drop down. Contact J4C to have this attribute turned-on. Can one advocacy coordinator assign another coordinator’s volunteers to cases? Yes, if the ACs are in the same Organization, and the Organization has been setup to share team members. Once sharing is turned on, any AC in the program will see all of the program volunteers in the Manage Cases assignment drop down. Contact J4C to have this attribute turned-on. Time to un-assign a case. Unassign or Delete? Select the Unassign link to un-assign the case from the volunteer; the case will stay on the volunteer’s My-Cases list. Select the Delete link to un-assign the case and remove it completely from the My-Cases list. Can I create Activity entries for my volunteers? Yes. As a staff member, you should see your volunteers in the team dropdown when you are creating/editing an activity record. Can one advocacy coordinator create activity log entries for another staff person’s volunteer? Yes, if the ACs are in the same Organization, and the Organization has been setup to share team members. Once sharing is turned on, any AC in the program will see all of the program volunteers in the Activity Log creation drop down. Contact J4C to have this attribute turned-on. When running an Activity Report, how can I include more than one Volunteer’s activity? In the drop down to select volunteers, simply hold down the SHIFT key when you mouse click each name. This step allows you to select multiple volunteers. The CASA Court Report doesn’t match our county’s report. Can we change CPRS? The J4C team can hide and re-order the sections available on the Court Report so that your volunteers & judges see only what you want them to see. Who can see the in-progress CASA Court Reports? Only the CASA assigned to the case and CASA Advocacy Coordinators can see in-progress Court Reports. Once the report has been Approved, then all allowed users can view that report. Do I have to start over & re-enter everything with every new Court Report that I create? No, instead of creating a new Court Report, simply Copy from an existing report, and your new report will be populated with the contents of the older report. How come the blank fields are printing in my Court Report? Draft reports print all of the fields (to serve as a reminder to your volunteers). Once the report is approved, blank questions are no longer printed. Can you explain Family Preservation (Private) cases? To add FP cases, you first have to search for a case. 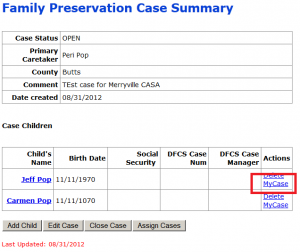 If you are viewing an FP case on the Family Preservation Case Summary, to add one of the children to your My Cases, then select the MyCase button in the Actions column for the target child. To assign a child to a volunteer, then select the Assign Cases button at the bottom of the page. This action will present the Manage Cases screen. 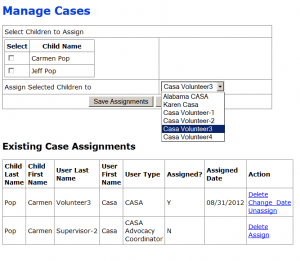 From the Manage Cases screen, you can assign or unassign children, and you can delete the child completely from the Volunteer’s My Cases screen. Supervisors cannot assign cases to other Supervisors. When volunteers login, they will see in the My Family Preservation Cases table all child that they have been assigned. Volunteers cannot search for or create FP cases.